Added by Debra Tash on April 15, 2019. 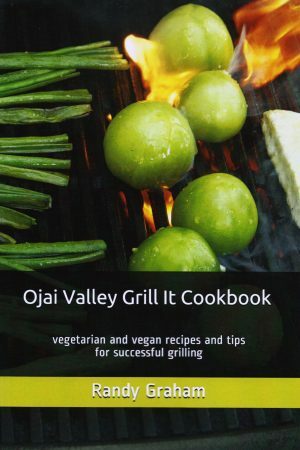 Ojai chef and author Randy Graham has a new book, Ojai Valley Grill It Cookbook. It is available on Amazon for $14.95. This is the sixth vegetarian recipe book in my Ojai Valley cookbook series. The 77 recipes in this book are grouped into five categories: Burgers and Kabobs; Sandwiches, Pizzas, and Flatbread; Vegetables and More; Sauces, Marinades, and Dressings; Mixed Drinks. You will find recipes for a panko encrusted Portobello burger, a balsamic and garlic glazed mushroom kabobs, sharp cheddar cheese and apple chutney sandwich, a traditional Margherita pizza, Mediterranean flatbread, my Dad’s secret BBQ sauce, an espresso-based vinaigrette dressing, and recipes that wet your whistle. All, except for the drinks, are for your gas or charcoal grill. The drinks are for you and your guests to enjoy while you grill and chill! Why drinks? It’s a grilling ritual. It’s a tradition, and one must stay hydrated when grilling (that’s a fact). And while I enjoy a cold beer or a glass of chilled rosé when I grill, I also like an occasional mixed drink. You’ll find recipes for Pisco Sour, Margarita, Gin Fizz, wine punch, and non-alcoholic fruit punch. As my friend Marcia M. says of me, I’m chillin’ ‘n’ grillin’ like a veggie villain! Randy has been a vegetarian since August 1975 and eats fresh and local as much as possible. He enjoys cooking for friends and family using ingredients from backyard vegetable and herb gardens. He is known locally as the “Healthy Chef,” and his food is often called vegetarian comfort food. He teaches at the Ojai Culinary School and his recipe column, Chef Randy, is syndicated in coastal California newspapers. He and his wife Robin live in Ojai, California, with their dog Willow. Robin and Willow are not vegetarians.